All of which cultural context makes for a formidable deal of irony when we come to consider the photographic work of Jolanta Dolewska. ‘Holding’ is a series of photographic images Dolewska made of actual Sheriff Court interiors. She writes in her short introduction about the intricacies, boundaries and limits that surround the law and the legal system, and that shape the space where knowledge and power determine validity and truth. How intriguing that photography – the two dimensional artistic medium par excellence – should be the chosen one to explore the interior aspects of a problematic which the finest literature has defined as indefinitely impenetrable! The most immediate and mundane elements of the implausibility of such a mission to the heart of ‘The Law’, however, must have been encountered in the general injunction against photography in the interiors of Scottish courthouses. Naturally Dolewska must have sought special permission from the Scottish Court Service to make these images. On a practical level this would have entailed examination of Sheriff Court timetables (most courts are in operation for the full five day working week), arranging and booking for an extended period of free time, setting up equipment, lights and choosing objects and angles for shots etc. Given that the shots she took are all of publically accessible areas and views (i.e. apart from one image of a holding cell, there are no shots of behind the scenes, none of jury rooms, of shrieval accommodation, of circulation etc. 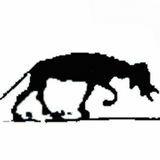 ), we might wonder what is the nature and the scope of that injunction on photography in the courtroom? The Scottish Court Service, transvested metaphorically in the fur coat, sharp nose and long thin Tartar beard of Kafka’s guardian, plays an administrative rather than a judicial role in the court system. This secular body allows the public access to these interiors, to view and enjoy these furnitures and fittings only while the process – the engagement of knowledge and power in the assessment of validity and truth, as Dolewska has it – is in session, that is, underway and in performance. A ban on photography while witnesses, accused and defendants occupy these precincts might be thought considerate, humane and prudent given the seriousness of the business at hand. Yet the ban here normally (i.e. but for the evident Dolewskan exception) runs to the images of the empty and silent room too. Just what would the illicit images supposedly bring to the surface of the citizen’s consciousness that is undesirable? What does Dolewska show? No doubt there is a ‘punctum’, a Barthesian agenbite of inwit with its sharp, provocative, unexpected call to our human and communal sensitivities, in each of these ostensibly banal, unmoved or unmoving studies. Thus, the telling stalk of the microphone visible beyond the concealing curtain; the sag of the taped up hose pipe as it hangs over the dock; the reflections in the reinforced glass screens which hint at depths and distances, compositions and the author’s pose. But why do the authorities effectively create a mystique around the otherwise banality of these rooms by their general imposition of the ban on photography? Is there a lingering notion that these secular, civil, public spaces (-albeit hierarchized in terms of position, height, access, sound and sightlines appointed to each party in a trial) somehow contribute to that formation of the ethical human community, which is the process of the law, in a way that could be damaged, devalued or prejudiced by a widespread exposure of, and familiarity with the nature of their out-ofhours mundanity? It is an idea all the more bizarre when we consider that the taking of photographs in an empty courtroom is not prohibited in some other jurisdictions (eg England & USA), and that Lord Gill’s recent report and recommendations for great changes in the Scottish court system also recommends that filming and broadcasting of Scottish court cases should be allowed. Dolewska may be inside the building, she may have special permission to inhabit and capture on film the interior of the courtroom, but does this guarantee her - or us, the viewers - any greater access to the law than the countryman of Kafka’s fable? She tells us she aims to ‘investigate surfaces’. Those are indeed what the empty courtroom offers to us with its screens, its partitions, its curtains, its windows with blinds drawn, and its timber panelled walls and doors. In her art, by definition, we are excluded from circulations with depth. We are not introduced to the theatre of justice here, but to an idle processing unit with its pragmatic and compromised divisions of space. There is no lightning flash of truth nor ringing bells of revelation; just fitted carpets, painted cast- iron radiators and the timber veneer of a vacant dock. We remember that the doorkeeper had given Kafka’s countryman a stool to sit on while he waited for the admittance that never came. In a similar way Dolewska’s images offer us small particular reliefs: in the wordless interior our eyes rest on the patched, haphazard stretch of the hose, on the reflection on the glass, on the folds of the curtains and the deliberate setting out of their hanging frame around the witness box. It is difficult to conceive how these banal details can contribute towards the ‘regime of truth’. For the law surely proceeds by a codification of the exemplary rather than by a catalogue of particulars and exceptions? Yet Agamben, cited by the artist herself here, points out that the exception and the example are ‘ultimately indistinguishable’. Under any investigation, he seems to say, the norm is always manifest as a long list of both comforting and dismaying exceptions. Thus, inside Dolewska’s courtroom, as on Kafka’s judicial threshold, we wait amongst exceptions that are the rule. 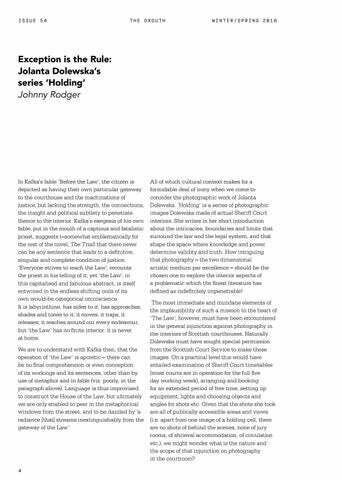 Johnny Rodger reflects on 'Holding', a series of photographic works by Jolanta Dolewska on courtroom spaces. From Issue 54, Interstices.